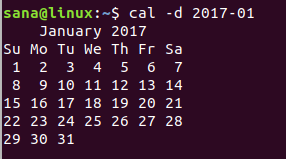 The graphical Calendar tool available on your Ubuntu system is pretty useful. 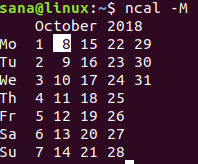 However, if you are more Terminal-savvy, you can use the powerful command line utilities like cal and ncal in order to customize the way you want to view calendars for a specific month or year. This article explains the cal and ncal commands in detail alongwith the options you can use with them. 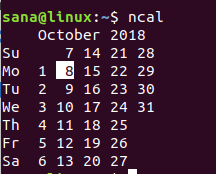 Since you will be using the Linux Terminal in order to view customized calendars, you can open it through the Dash or the Ctrl+Alt+T shortcut. -1 Use this option to view the calendar of only one month. Since this is the default setting, you can avoid using this switch unless necessary. -3 Use this option in order to view calendars for three months; these include the current month, the previous month, and the coming month. -A [number] Use this option when you want to view an X number of coming months along with the calendar you have already set for viewing. -B [number] Use this option when you want to view an X number of previous months along with the calendar you have already set for viewing. -d [YYYY-MM] You can view the calendar of a specific month of the specific year by mentioning that year and month in YYYY-MM format with -d option. -j You can use this option to view the calendar in Julian format rather than the default Gregorian format. The ncal command is more powerful than the cal command. It displays the calendar in a vertical format with some more additional options. These include displaying the date of Easter, viewing calendar with Monday or Sunday as starting days and much more. Note: The options already explained for the cal command can be used in the same manner for the ncal command. 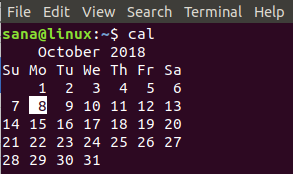 -h By default, the cal command highlights today’s date. However, if you use the the -h option, it will not highlight the date. -e Use this option to view the date of Easter for western calendars. -o Use this option to view the date of the Orthodox Easter. -p Use this option to view country codes and switching days that are used for switching from Julian to Gregorian calendars for that country. -w When you use this option, ncal will print the week number under each week. -C By using this option, you can use all the options of the cal command with the ncal command. -M Use this option to view calendars with Monday as the first day of the week. -S Use this option to view calendars with Sunday as the first day of the week. The following command will display the calendar of the current month with Monday as the first day of the week. 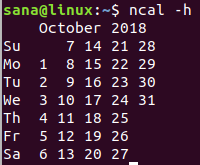 Through this article, you have learned to view calendars according to the many options available for the cal and ncal commands. 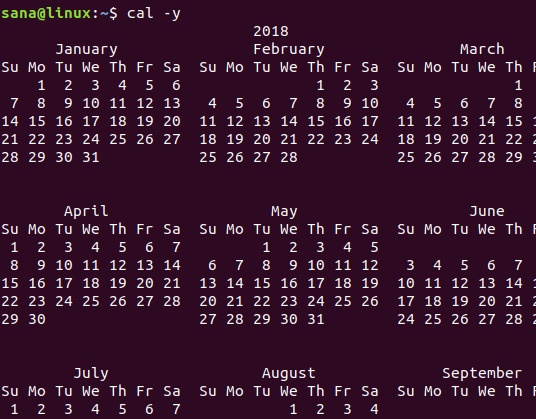 By using these options you can customize the way you want to view calendars instead of the usual way calendars are displayed in Linux.